The global financial crisis has put a glitzy project in the Dallas Arts District on hold, at least for now. A model of Dallas' Museum Tower. Museum Tower is set to go up on a plot of real estate between the Nasher Sculpture Center and the Morton Meyerson Symphony Center in downtown Dallas. The land is currently being used as a parking lot. 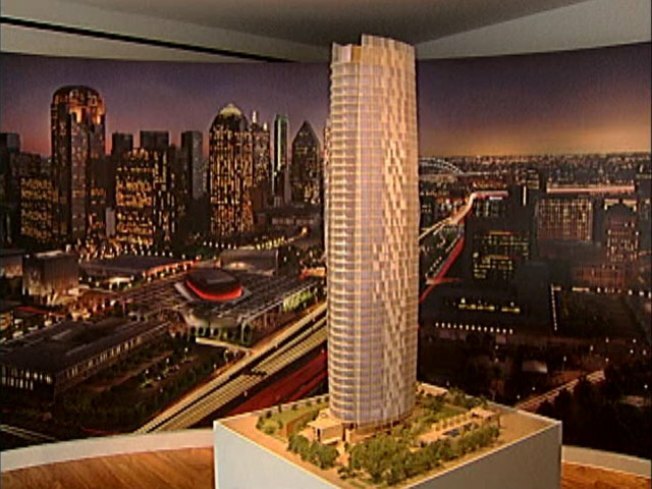 The tower itself would rise more than 500 feet over the Arts District. It would have 42 stories of luxury living. Prices start at more than $1 million for a single residence. The building's unique tapered design would create a new landmark on the Dallas skyline. Developers had hoped to start construction by now, but the frozen credit markets have halted the flow of money needed to move forward. Museum Tower partner John Sughrue says, "Certainly with what's happened in the last 30 days... has made the lending community step back from the project." Depite that, Sughrue is still confident that Museum Tower will become a reality. As soon as the credit markets thaw, he expects financing to happen quickly. He points to $50 million in pre-sales, the project's prime location and the strong Texas economy. Groundbreaking is expected sometime in early 2009.